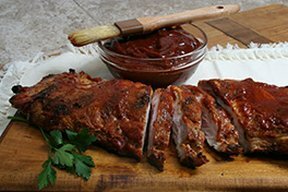 A mouth-watering recipe of pork ribs grilled to perfection with a homemade barbecue sauce. A great recipe to share this Father's Day at your backyard barbecue with friends and family. Try any of our delicious grilling recipes for your next summer get-together. See a demonstration on how to grill a marinated flank steak to create a juicy and flavorful entree for your Father's Day celebration. Check out our guide on grilling fruits and vegetables to bring out their natural sweetness and enhance their flavor.